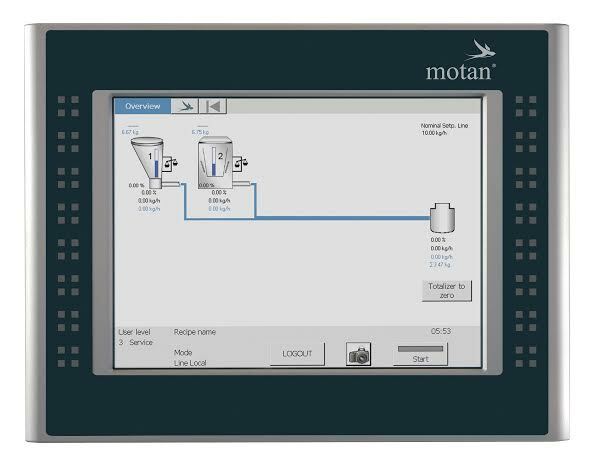 For motan-colortronic, integrated process management is of great importance. This is why state of the art ancillary equipment and the entire upstream technology of the plastics process – injection moulding, extrusion, blow moulding, compounding etc. – is always developed in tandem with state-of-the-art control technology. A significant advantage is the ability to integrate within the systematic motan control concept known as CONTROLnet. GRAVInet GP light – a compact gravimetric control for up to two dosing modules is the newest innovation of the motan control family for process-optimised storage, conveying, drying, dosing and mixing of polymers and compounds. Regulating the process – in close-loop control with feed-back – is part of everyday industrial life. With regard to optimized process management, it is important that compatibility between various control units and superimposed systems (such as process data acquisition, plant visualization etc.) is assured, preferably also regarding systems of different origin. The process experts at motan-colortronic deal with this issue on a day-to-day basis and have developed appropriate solutions. The results are control systems of modular design which are nevertheless tailored to individual process situations. The GRAVInet GP control system has been joined by a smaller high performance brother, GRAVInet GP light. GRAVInet GP light is a compact control system for up to two dosing modules. It has been entirely designed in a modular way – the logic and all interfaces including the HMI (human machine interface), etc. The well-known operator interface from the GRAVInet GP control has been retained, but equipped now in the GRAVInet GP light with a new WEBpanel with a 12.1″ TFT touch-screen. The internal and external communications take place via Ethernet. GRAVInet GP light is a full-value member of the motan CONTROLnet control system family. GRAVInet GP light allows excellent compatibility with all motan controls in the area of storage, conveying, drying, dosing and mixing. Its integration is performed with the aid of a WEB application via Ethernet. This compact control is designed for one line and regulates two material components continuously, gravimetrically and synchronously. The new control variant is characterized by an excellent price-performance ratio and is completely downward compatible with the previous GRAVIPLUS hardware.